A different soup with a different taste! The use of many ingredients in this soup has a lot of health benefits and is best suited for the monsoon season to fight against flu, cough and cold. 1. Heat the oil in a pan. Add the garlic and onions and sauté till the onions turn translucent. 2. Add the baharat, salt, black pepper and tomatoes and sauté for another 2 minutes. 3. Add the vegetable stock and bring to boil. 4. 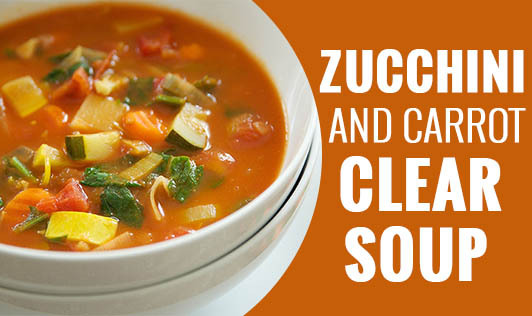 Lower the flame and add the zucchini, carrots and celery. 5. Cover the pan with a lid and allow to simmer for about 20 minutes or till the vegetables are cooked. 6. Add the parsley and mix well. 7. Serve hot with pita bread. *Baharat is a spice mix easily available in the market. It is a mixture of spices like cardamom, cinnamon, black pepper, cassia bark, cloves, cumin seed, coriander seeds, nutmeg and red chilli.